How are U.S. Climate Zones defined? 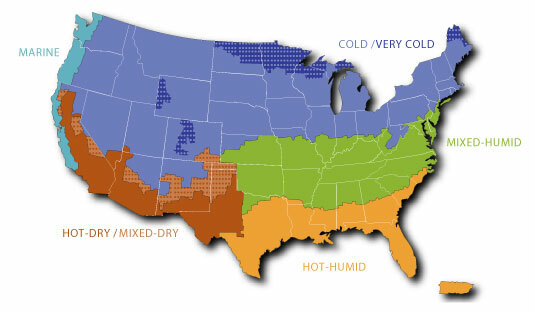 The 2012 CBECS is no longer using the historical HDD- and CDD-based climate zones as in previous survey cycles and is instead using climate regions created by the Building America program, sponsored by the U.S. Department of Energy’s Office of Energy Efficiency and Renewable Energy (EERE). EERE’s Guide to Determining Climate Regions by County contains a list of all U.S. counties by climate region. A HDD is a measure of how cold a location was over a period of time, relative to a base temperature (in CBECS, 65 degrees Fahrenheit). The heating degree-day is the difference between that day's average temperature and 65 degrees if the daily average is less than 65; it is zero if the daily average temperature is greater than or equal to 65. For example, if the average temperature for a given day is 40 degrees, then the heating degree-days for that single day equal 25. Heating degree-days for a year are the sum of the daily heating degree-days that year. Similarly, a CDD is a measure of how hot a location was over a period of time, relative to a base temperature (65 degrees Fahrenheit). The cooling degree-day is the difference between that day's average temperature and 65 degrees if the daily average is greater than 65; it is zero if the daily average temperature is less than or equal to 65. For example, if the average temperature for a given day is 80 degrees, then the cooling degree-days for that single day equal 15. Cooling degree-days for a year are the sum of the daily cooling degree-days for that year. There are 359 NOAA climate divisions within the 50 U.S. states. Boundaries of these divisions generally coincide with county boundaries, except in the western U.S., where they are based largely on drainage basins. For a map of all the NOAA climate divisions in the U.S., see http://www.esrl.noaa.gov/psd/data/usclimdivs/data/map.html. For individual state maps that show the NOAA climate divisions by county, see http://www.cpc.ncep.noaa.gov/products/analysis_monitoring/regional_monitoring/CLIM_DIVS/states_counties_climate-divisions.shtml. Each building in the CBECS is assigned a CBECS climate zone based on the 30-year average (1971-2000) HDD and CDD (base 65 degrees Fahrenheit) for the NOAA climate division in which the weather station closest to the sampled building is located. This Excel file provides the CBECS climate zone for each U.S. county. Usually, there is only one climate zone per county and the mapping is straightforward. However, in some of the Western states, the NOAA climate divisions (on which the CBECS climate zones are based) are defined more by drainage basins than by counties, and so sometimes there is more than one climate zone per county.